Offering a plethora of things to do, from desert dreams to mountain magic and world-class Malbecs, Mendoza is one of the most spectacular destinations in all of South America. 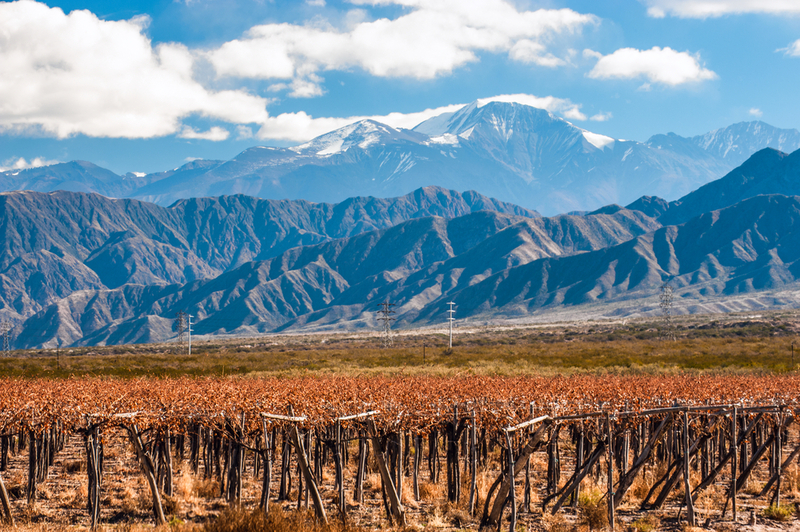 Your Guide to the Mendoza Wine Region of Argentina is your ticket to paradise and introduces you to some of the country’s most unforgettable highlights. With its five delightful plazas enticing you to stay and meander just one more day, Mendoza is one of South America’s most beautiful cities. We’ve yet to meet anyone who’s been and hasn’t fantasised about moving there one day, and we’re quite sure it’s not all to do with the world-acclaimed wine, although we’re sure it helps. Whilst locals may complain about the impending modernity which is swiftly sweeping through this most prominent region of Argentina, visitors still swoon over its incredibly rural atmosphere. A region and village first settled by the Spanish in the middle of the 16th century, Mendoza is at the unique point in its evolution when it manages to perfectly blend modern-day amenities and comforts with the charm of a bygone colonial era. Vibrant modern hub and relaxing country town all at once, Mendoza is one of those rare gems, much like Bariloche in the south, you’d be wise to spend a few days exploring. Although be warned…you’ll probably never want to leave. This is Argentina’s stunning desert country, the Cuyo region, sitting snuggly at the foothills of the Andes Mountain range. Artificial irrigation on these lands, coupled with an idyllic continental climate, has created a striking man-made oasis hub, one which sees barely a handful of rainy days a year. This is where Argentina’s best award-winning wineries are to be found and where great food abounds, activities overflow and nature reigns supreme. We’ll admit that a wine-tasting stint in Mendoza is about as good as life in Argentina can get, but there’s actually a host of other highlights here as well. Alongside a near endless array of fantastic bodegas and wineries to visit, there’s a wide range of adventure pursuits on offer, thanks to the proximity of the mountains. White-water rafting, horseriding and hiking are the most popular, with treks to the highest peak in the Americas, Mt Aconcagua, a Holy Grail for mountaineers the world over. Cordon del Plata nearby boasts several peaks of between 5 and 6,000m, as well as several rock-climbing meccas that are renowned in the international circuit. Let us know if you dream of a specialised mountaineering or rock-climbing tour and we can arrange all the logistics for you. Visit in winter and you can alternate wine-tasting days with brilliant skiing in the country’s largest ski resort at Las Leñas. Mendoza town itself is pretty as a picture, probably Argentina’s prettiest, in fact. It was completely flattened in a devastating earthquake in 1862 and the wide avenues were purposely designed to aid in evacuation when it was rebuilt. The town is exceptionally green, considering the arid origins of the land on which it stands. The overabundance of trees help the town cool down at the height of the at-times brutal summers. The fact they make the city look so incredibly divine is just an added bonus. Life in Mendoza centres on the city’s five main plazas, each boasting its own design and appeal. On Plaza de la Indipendencia you’ll discover an artisan night and weekend market brimming with numerous stalls full of amazing hand-made treasures. The breathtaking colourful mosaic fountain on Plaza España makes it the prettiest, perhaps, with murals recounting the tales of the city’s history. Don’t forget to visit St Francis Basilica on Plaza San Martin, arguably the city’s most striking church, and home to an image of the Virgin of Cuyo many faithful deem to be miraculous. City centre is compact and walkable, especially if you’re not in a hurry. In summer, expect everything to shut down between 1 and 5pm for siesta. If you’re feeling particularly active then head up to the top of Cerro de la Gloria. 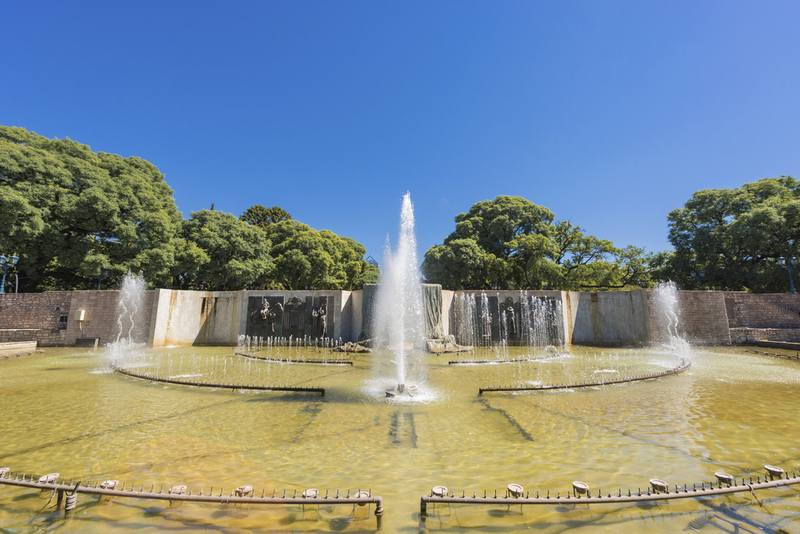 You’ll find the path starting behind the city’s zoo in Parque San Martin. 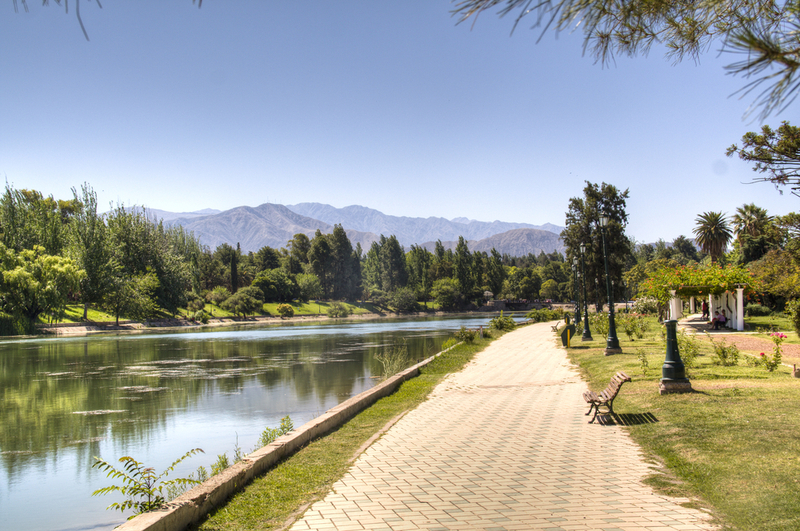 The park with its idyllic lake is a popular strolling and cycling destination in Mendoza (and perfect for a summer siesta, might we add) and the top of the hill grants wonderful views of the whole city and beyond. 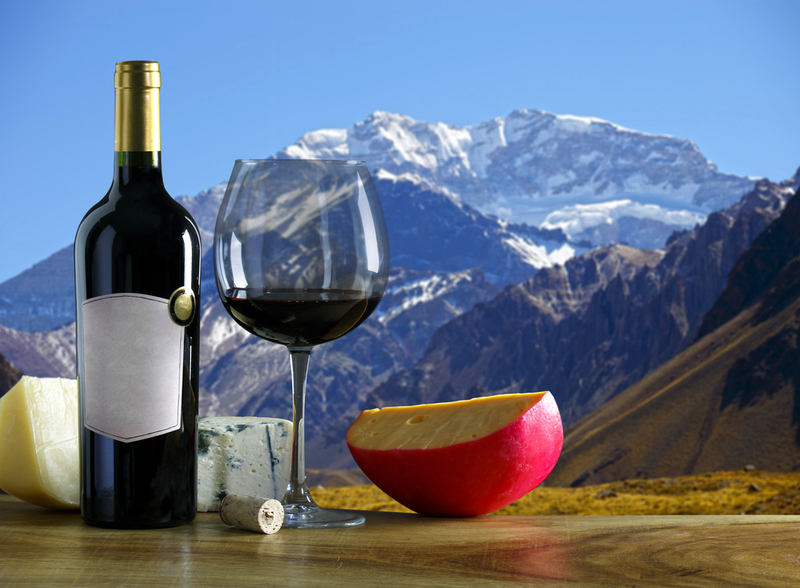 Mendoza also offers abundant gastronomic experiences, the kind for which Argentina is so renowned. Good strong cups of coffee complemented by mini croissants oozing with dulce de leche, afternoons spent chatting with new local friends sharing mugs of mate and hearty meaty asados at the end of every day. Adventurous foodies would do well to explore every nook and cranny of the Mercado Central, a heavenly epicurean destination with few rivals in town. For an added touch of indulgence you’ll find a wide range of boutique hotels, wine resorts and ranches which make a stay in Mendoza particularly memorable. On the outskirts of the city are quite a few well-appointed accommodation options, some boasting a swimming pool, vineyard, stunning views and luxury service and amenities. If you’ve met anyone who’s been to Mendoza and still dreams of moving there permanently, you can trust they’ve sojourned in one of the city’s best digs. Don’t discount the fact that the Argentinian peso makes travel here affordable. 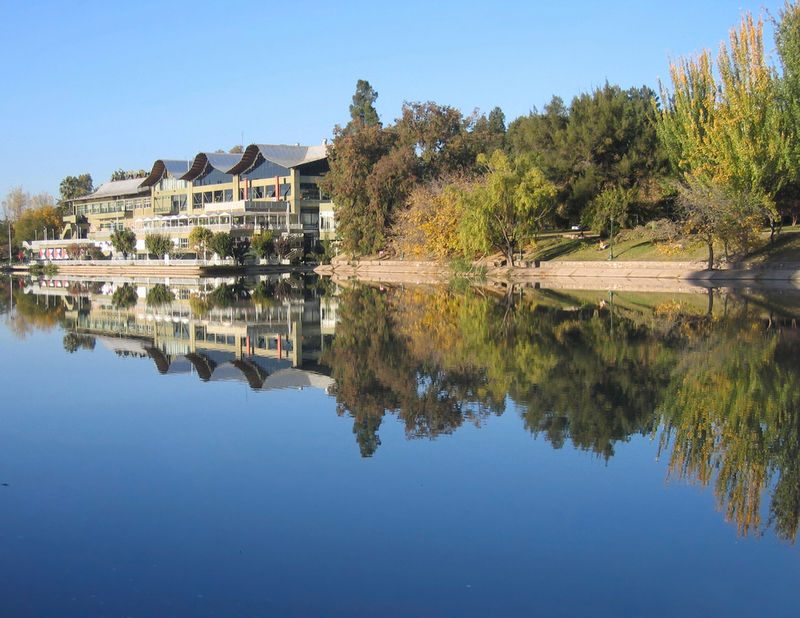 Even the most luxurious options in Mendoza are very well priced, especially for Australians. 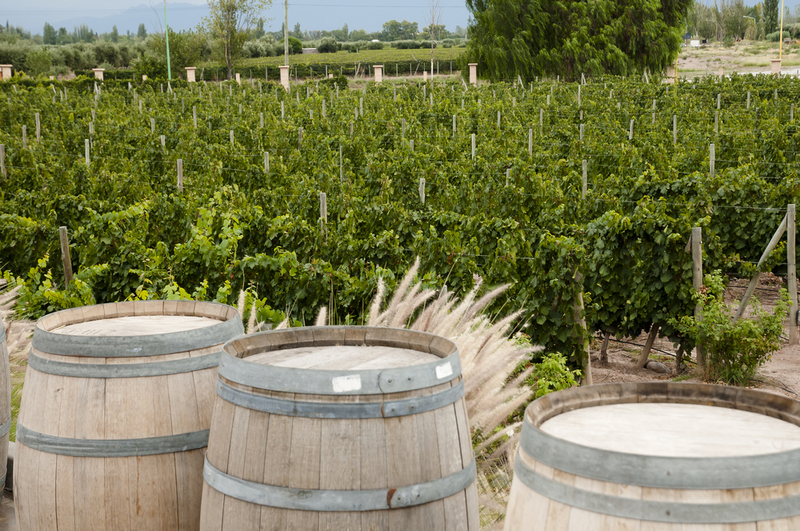 Wine tours are a must here and it would certainly be a travesty to plan a tour of Mendoza without keeping a couple of days aside for visiting vineyards. Distances are considerable though, and in-between sightseeing stops inevitable, so plan on fitting in 2 or maximum 3 vineyards in a full day wine discovery tour. A few of the wineries offer walk-in tours yet most require pre-bookings. It’s a good idea to have an itinerary planned and to contact the winery ahead of time to ensure they are open, as sporadic closing of gates is not uncommon. Of course, we can help you plan an ideal wine tour taking your tastes (of Malbec and Merlot, particularly) in mind. The Uco Valley Wine Region is a specially created wine haven where it is said the best Malbec and Chardonnay varieties of grapes are grown. Only an hour’s drive south of Mendoza, the Uco Valley is a destination onto itself with its higher-altitude location right at the foothills of the Andes making it a simply spectacular place to visit, irrespective of wine. Even if you never tasted a drop you’d be well advised to cast your eyes on the Uco Valley’s mesmerising landscapes. The valley is long and narrow, dotted with even more charming towns for you to discover. This is an unforgettable corner of one of South America’s best wine regions, so don’t miss it! Cycling your way through the vineyards is also a barrel of fun although a little hard work in summer and most certainly by the end of a wine-tasting day. If you’re particularly vino-crazed then you should definitely consider visiting Mendoza during the Harvesting Festival, when the city springs to (even more) life with music, parades, dancing, great food and, of course, free flowing wine for a whole weekend. Mendoza is well serviced by an International Airport which connects visitors to popular destinations like Buenos Aires, Santiago, Iguazu Falls, Salta and Cordoba, among others. The ‘Rome’ of Argentina, Mendoza is also well connected by road to other destinations like Montevideo, Lima and Bariloche, and that’s what makes it an easy and very popular inclusion on many Argentina overland tours, for those with a little more time on their hands. Mendoza’s strategic location has undoubtedly boosted its popularity. From here, it’s less than 400km to Santiago, the Chilean capital, and just over 1,000km to Buenos Aires. The latter may seem a bit far, we grant you, were it not for the fact that the ride takes you through some rather spectacular landscapes, in what is one of Argentina’s most picturesque regions. When people say “the journey is just as memorable as the destination” we automatically assume they’ve been to Mendoza by road. For the above-mentioned reason alone, Mendoza is an exceptional place to visit at any time. When it’s too cold to hike then it will be perfect to ski. When the snow is all gone then you can bet that the rafting is top-notch. Summer temps, between December and March, hover between early 30s Celsius during the day and mid-teens at night. Harvest is done from April onwards, at the end of summer. By the end of May the entire Mendoza region basks in the most magnificent warm hues of reds and browns. Temps in winter range from 1-2 degrees to about 14 C during the day. Fresh air, crisp skies and sharp colours make the whole area shine resplendently. Want to ski? Visit from July to September. Dreaming of a wine tour de force in Mendoza? Then check out our most popular Mendoza tours or, better still, ask us to devise an itinerary that’s created just for you. Here at Chimu Adventures, we strive to offer the most personalised and unforgettable Latin America travel experiences in the world. 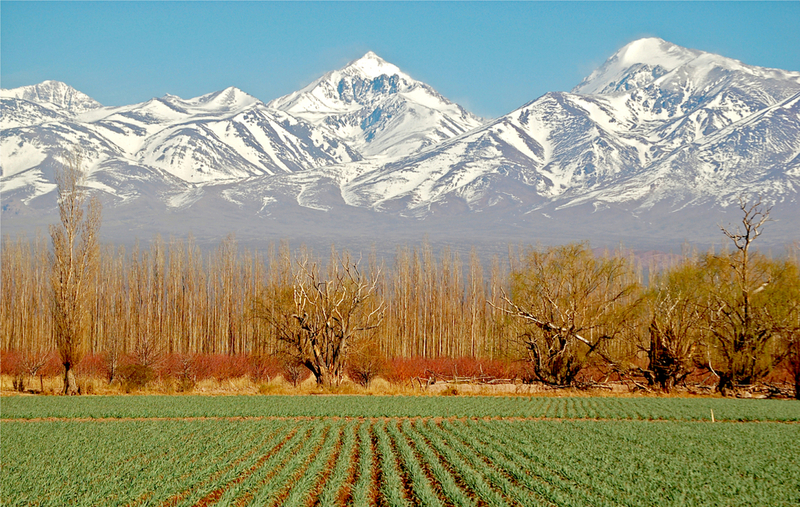 And yours could have no better starting point, than the Mendoza Wine Region in Argentina. When it comes to Argentinian wine most people are familiar with Malbec, which the country has adopted as its national grape. If you are a wine lover and want to learn more about Argentinean wines we invite you to enjoy this 4 day journey into Mendoza wine valleys.